1. First and foremost, this is not about politics. Comments that attempt to reduce the discussion to political partisanship or party fanaticism will be ignored. 2. Don’t get ahead of ourselves by rushing to an overly simplistic solution. There are no right answers. 3. Don’t get too carried away debating the doctrine as it is presented here. In many cases I will be simplifying, perhaps even distorting some of the concepts in order to focus the discussion. 4. I am not seeking commentary from academics, military and diplomatic professionals or the like as there are plenty of peer-reviewed professional journals for those communities to satisfy their passions for debate. However, I would be grateful for any “grey beards” out there who might offer me suggestions on how to facilitate a more rewarding discussion here. As future discussion will be focused on the factors that apply to security issue at the national and international levels, it might be useful to frame what defence planners understand to be the various levels of defence strategy. To do so, it might be easier to start from the outside in, and from the tactical level first as that is probably easier for everyone to relate to. The tactical level is where the bullets fly and people die. It is the level where the “rubber meets the road” with “boots on the ground.” At the tactical level it is pretty easy to identify who the leaders are and exactly what courage is, what is vitally important and what constitutes unnecessary distractions. At the same time, the tactical environment can be the most unpredictable, confusing, terrifying and, often, senseless place on Earth. At the other end of the continuum is the strategic level. General Sir Rupert Smith, in his opus The Utility of Force, says of the strategic level: “[having] made a decision at the political level to enter conflict, activity moves to the strategic level, in which the political purpose of having recourse to military force, either as a potential or in the actual use of force, is translated into formations and acts.” In practice, at this point there is a flurry of interdepartmental activity and, as I experienced personally in the formulation of Canada’s campaign plan for Operation ATHENA in Afghanistan, there is much consultation with our allies when our military prepares for international operations. 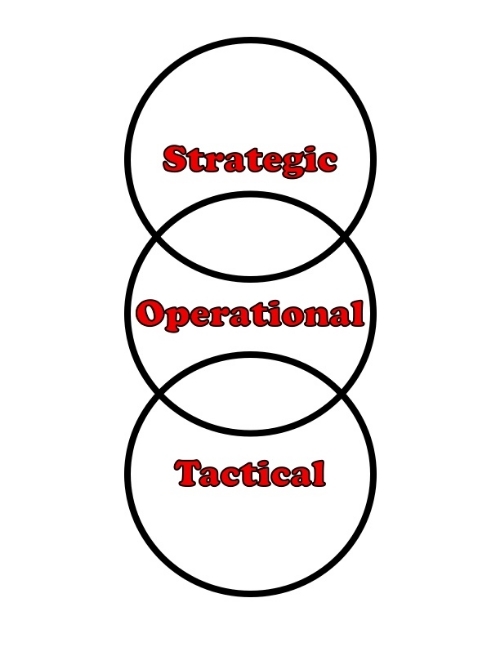 According to military doctrine, sandwiched between the strategic and tactical levels is what is referred to as the operational level of war. As General Sir Rupert describes it, at the operational level the theatre commander orchestrates tactical-level objectives to satisfy the goals laid by his (or her) strategic masters. Philosophically, this operational level function is clear; however, where exactly that function manifests itself is open to interpretation. In fact, in military circles in Canada it is often argued that our military does not practice “operational art” — the interpretation of strategy into tactics — because we are in the habit of plugging our military forces into coalition-based operations to do what everybody else is doing. Our military further confuses the issue by generating intermediate headquarters between our tactical headquarters and strategic echelon in Ottawa that have no executive role in the actual conduct of operations. The military will refer to them as operational level headquarters although they exist mainly to effect liaison with our coalition allies. Reflecting on my own experiences again, this time as the land component commander during Operation APOLLO, in my opinion I was firmly entrenched in the operational level. I never made a tactical plan or decision — whether it was integrating our operations with the mujahedeen that we were working with, launching sub-unit offensive operations, or simply detaining people — without thoroughly considering the ramifications our actions might have politically back home and, as a consequence, on our ability to satisfy our assigned mission. That said, I reported to a commander co-located with United States Central Command Headquarters in Tampa, Florida, but their practical function was to relay messages between my HQ and that of the air and naval elements that were also deployed with National Defence Headquarters, where the real decisions were made. And then, to confuse the distinction between the levels even more, there is the phenomenon of the “strategic corporal” that slipped unofficially into the doctrine. The strategic corporal is a metaphor for soldiers on the front line of the tactical level whose actions in this Information Age can have immediate and considerable consequences at the strategic level. As such, everybody throughout the chain of command to the very highest levels of government become excessively sensitive to everything that happens anywhere in a theatre of operations. The Canadian Armed Forces expends huge amounts of money codifying war and how the nation will fight them, as well as training and educating the senior officers who will be expected to prosecute them. The military also goes to extraordinary lengths to ensure their doctrine is interoperable with that of other allied nations but, interestingly, those doctrines are often almost exclusively the chattels of the military. Politicians, diplomats and bureaucrats, who are equally accomplished as their military counterparts and often highly schooled and experienced in their own right, will almost certainly not be purveyors of that same body of knowledge. Their respective professional norms and tendencies may not even be complementary to those of their military counterparts. One of the great challenges at the strategic level therefore can be to overcome the cultural stovepipes that tend to define these various branches of government. It is easy to see why the military will tend to describe the strategic environment as volatile, uncertain, complex, and ambiguous. And now for some audience participation. With the preceding description of the various conceptual levels of war, how much of the strategic level commentary and debate that we bear witness to regarding our involvement in the Middle East is of a truly strategic nature versus tactical? What do we know of a Canadian strategy for our involvement in Iraq, and how does that compare to our understanding of the tactics of the mission? Is the debate over boots or bombs a strategic issue and, if yes, how so? Anybody out there who has some opinions to offer is asked to submit them in 200 words or less. The most thought-provoking or insightful commentary emailed to thecolonel@espritdecorps.ca will be presented in the next instalment of this column, and the contributor will receive a copy of my new book Rude Awakening: The Government’s Secret War Against Canada’s Veterans.